Carlisle is a suburb located approximately 8 kilometers south east of Perth. It is part of the Victoria Park local government. Its estimated population is 5400. 50% of this population are young, maturing and elderly independents. The suburb of Carlisle was established in 1829 with the growth of real estate development not commencing until after the 1890’s. The surrounding suburbs of Carlisle are – Lathlain, Rivervale, Kewdale, East Victoria Park, Welshpool, Karawara, Bentley and Queens Park. Along the west border of Carlisle runs the railway line with train stations named Oats Street and Carlisle. There are four parks Parnham Park, Tom Wright Park, Fletcher Park and Carlisle Reserve. There are 2 nursing homes, a primary school, a bowling club and a seniors centre. The South Metropolitan of Tafe has a campus at Carlisle. In relation to the demand for property Carlisle is just above average. To purchase a 2 bedroom home would cost $412,000 and a 3 bedroom house would be $562,500 as of February, 2017. If you are thinking of buying or selling a unit the average value is $435,000 with a rent return of $360 per week. Property values for both homes and units has fallen about 5% over the past year. Porter Matthews has sold over 47 properties in Carlisle and rented out over 1000 residences! Our knowledge of property values is second to none. 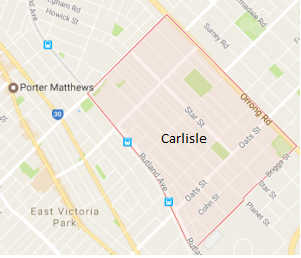 We know the suburb of Carlisle intimately which is why our word of mouth is valued highly. Property Valuation and Real Estate Appraisal Carlisle, WA. Valuing a property for sale or rent is an exercise we treat in a professional manner. Gaining the maximum price for the sale of any type of real estate is our job. We have a database of potential investors and buyers. When we provide a real estate appraisal you will be sure to get an accurate price for your property. Real estate for sale in Carlisle WA 6101. THE GENIE AND YOUR WISHES!